This unique supplement is specially formulated for horses and ponies and provides selected feed nutrients, minerals, vitamins and specific feed additives, proven to be beneficial to equines. What does SUPAlyx Horse & Pony contain? Protein : The primary nutrient needed for the formation and repair of muscle tissue. Important for young, growing and working horses and to help lactating mares produce quality colostrum. Provided from soya which is a rich source of the essential amino-acid lysine. Minerals, trace elements and vitamins : Full of all the essentials required for good skeletal growth, strong hoof structure, energy metabolism, a healthy immune system and much, much more. Diamond V XP LS Yeast Culture : An exclusive natural yeast product giving probiotic benefits, it has been proven to improve hind gut fermentation and will help to maintain a healthy digestive system, which can lead to enhanced athletic performance. Molasses : Turns this feed into a convenient, labour saving, weather-proof lick which is palatable and allows for the more natural ‘little and often’ approach to feeding. Contains less molasses than other cooked molasses licks. Specification : Protein 13%, Oil 1.1%, Fibre 1.3%, Ash 25%, Calcium 4.5%, Phosphorus 0.7%, Sodium 3.5%, Magnesium 1%, Selenium 4mg/kg, Cobalt 5mg/kg, Iodine 4mg/kg, Manganese 500mg/kg, Zinc 1500mg/kg, Copper 200mg/kg, Vitamin A 150,000iu/kg, Vitamin D3 15,000iu/kg, Vitamin E 500iu/kg, Biotin 40mg/kg + Vitamins K, B1, B2, B3, B5, B6, B9, B12. Includes an organic form of selenium and chelated copper and zinc for increased availability. 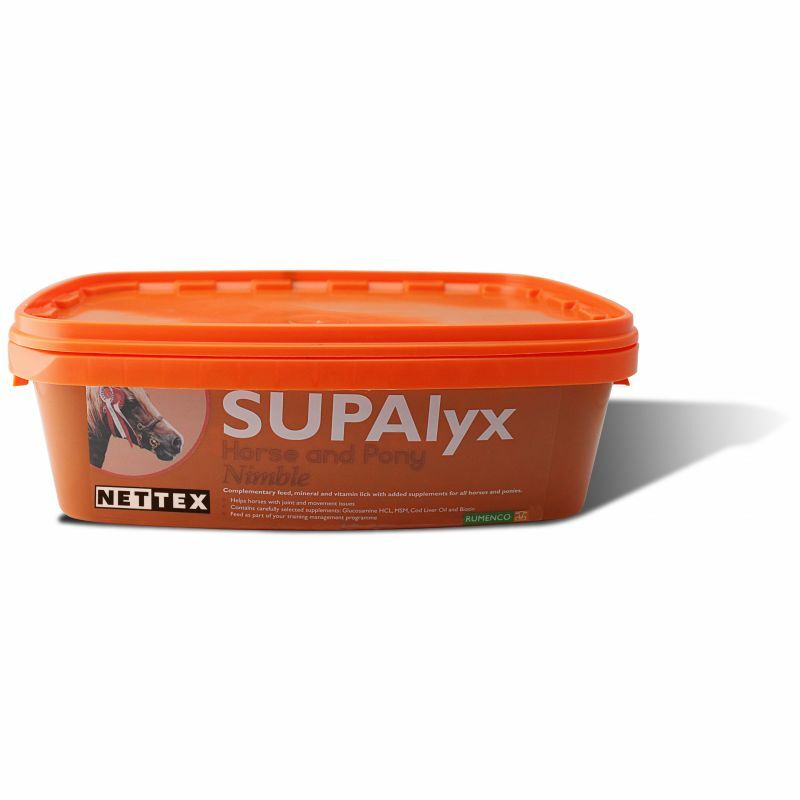 How to feed SUPAlyx Horse & Pony buckets ? As with any new feed, introduce gradually into the diet especially before allowing free access. Ensure adequate forage or grazing is always available. Daily intakes may be up to 400g per head, but this is influenced by many factors such as other feeds available, forage quality, work load, age and size. Handles can be removed on both tub sizes if necessary. 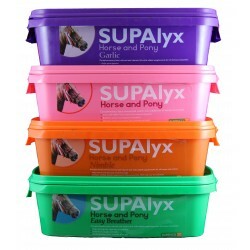 • A smaller tub perfect for feeding individually in the stable. 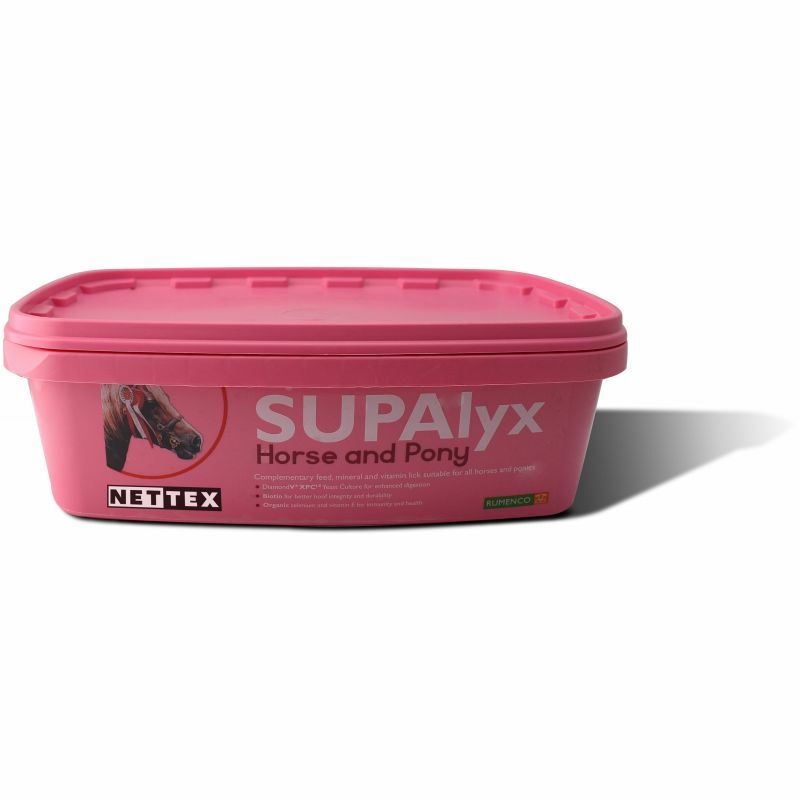 • Allow 1x3kg tub per stable. • Can also help to reduce boredom when horses or ponies are stabled for long periods. plus a carefully selected blend of eucalyptus, menthol, plant extracts and essential oils. 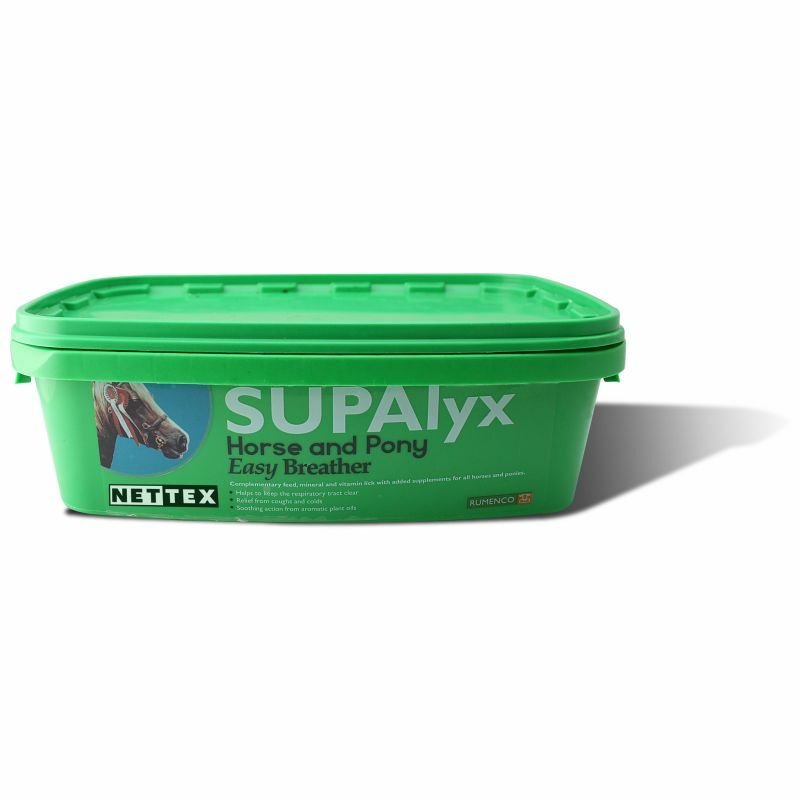 Feed all year round to help maintain a healthy respiratory system, especially when stabled or in hard work. plus selected supplements to help maintain healthy joints, for optimum mobility and free moving action. Feed all year round as part of your training and management programme. • Contains Glucosamine HCL,Methylsulfonylmethane (MSM),Cod Liver Oil, Vitamin C.
plus additional garlic to help repel biting insects and offer extra health benefits. Feed all year round but especially in the summer months for its fly repellent properties.